On September 10, 2001, I never dreamed of the United States being attacked as it was on September 11, 2001. For many people like me it was a harsh wake-up to reality. Over the years since 9/11 the question keeps coming up, mostly from politicians, ‘do you feel safer now’. My answer is a very loud ‘yes’ if we are referring to attacks from outside the United States. If the question refers to attacks from within the United States, my answer is increasingly becoming a very loud NO. The reason is very simple, we are asking for it with our politically correct, multicultural fear of saying or doing anything that might offend Islam. From the December 16, 2006 edition of the Tennessean (image found here):Gov. Phil Bredesen [Democrat, Tennessee] has given an unusual twist to his family’s Christmas card: He is marking a Christian holiday with a card depicting a Muslim girl. 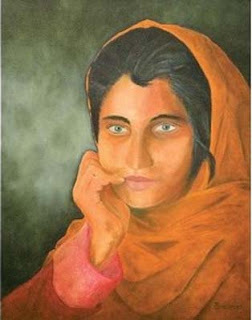 The card’s cover is a print of a painting by the governor of a young woman he met when he toured Afghanistan in March. And at least one Muslim has criticized the card. In happy-holiday wishes for Christians, Khaled Sakalla, spokesman for the Islamic Center of Nashville, has voiced criticism of the card: …[I]f the governor saw a Muslim woman in Afghanistan as depicted â€” with her head partially uncovered â€” that’s not the Muslim dress code.”Women shouldn’t have their faces fully covered, nor should they have their hair half-uncovered,” Sakalla said. Looks to me like heâ€™s using a Christian holiday to pander to a religion that has nothing to do with Christmas. Why not put a Menorah on the card then? The enemy thrives on the weakness of it’s enemy. When Americans are weak and submissive it only enables the enemy to win this war. Trying to negotiate with Syria and Iran is a sign of weakness. They do not want to negotiate, they will not give up anything. North Korea knows what they are doing. Every time they have a little nuclear hissy-fit, we give them something. We show weakness. We let Hugo Chavez come here in our home and slap us in the face. Weakness on our part. We tell Hamas ‘no more money’ until you recognize Israel’s right to exist. Then we turn around and give them money. Weakness again. Again we show weakness and the enemy takes advantage. We have cowards and traitors in our midst calling themselves politicians and patriots. This week we have a military build up in the Gulf, but our government was quick to reassure Tehran that we have no intention of attacking them or starting a war. I thought having a military presence was supposed to put the fear of God into our enemies. I guess I was wrong. We allow CAIR to determine what we can say and do about Islam in this country. We allow rogue imams to set what security measures we take on our passenger jets. We’re afraid of offending anyone and we pur security in second place over political correctness. Do I feel safer today? No, not from what is taking place inside our borders. Wake up folks. There is nothing accidental about what’s going on. It is all written in the book, the Koran. It has been practiced for centuries. Wake up. Take back America from the PC police, from the ‘we must not offend Islam or Muslims’ crowd. We are a Christian nation and we can’t even celebrate the birth of our savior without putting a Muslim on our Christmas cards? The White House can’t send out an official card with the word Christmas on it? Just bend over and kiss America good-bye. 1 user commented in " Have yourself a Muslim little Christmas "
Good posting. I just wish every liberal politician and voter would read it. Perhaps he could have had the Muslim girl holding the Menorah.